Tianmen Cave known as Gateway to Heaven is a natural bridge/arch and is reportedly highest elevation (1520 metres) natural arch in the World. Although it is an arch but locals call it a cave. As per local history it used to be cave and in circa 263 there was a massive collapse of the cliff face, which changed the cave into an arch. 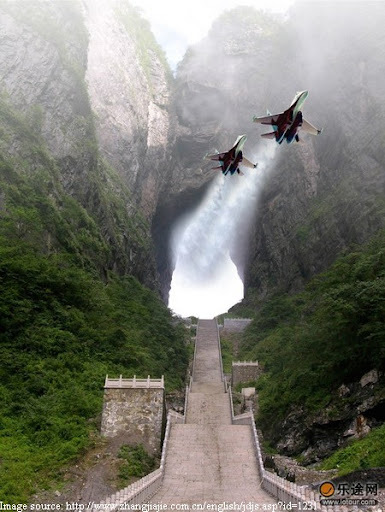 At that time the mountain was called Songliang, which was then changed to Tianmen meaning sacred. It is 131.5 metres high, 57 metres wide and 60 metres deep. It is located close to Zhangjiajie city in western Hunan Province, China and is part of Wulingyuan Scenic Area - a UNESCO World Heritage Site. One has to climb 999 steps to reach the top. Co-incidentally or may be intentionally in 1999 stunt flyers flew through the arch. The show was broadcast live on TV and was watched by an audience of several hundred million. 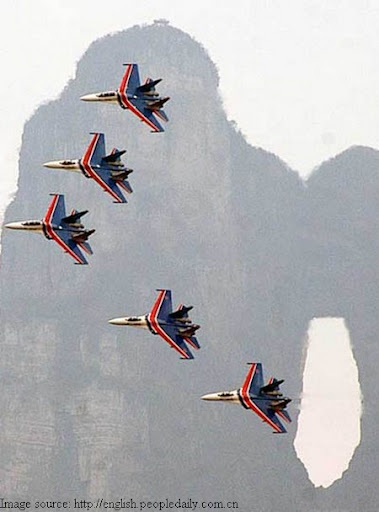 On March 17, 2006, five Russian SU-27 fighter jets also flew through the arch in a stunt flight. The whole area is very scenic and was not easily accessible. However Tianmen Mountain Cableway - reportedly the longest passenger cableway in the World with a length of 7200 metres and a height gap of 1277 metres, now brings thousands of tourists to this natural wonder.